National Military Appreciation Month (NMAM) is celebrated each May as a symbol of unity, and to honor current and former members of the US Armed Forces – including those who have died in pursuit and in protection of our freedom. At WilsonHCG, we feel it’s important to say “Thank You” to those who’ve sacrificed and continue to serve. There are a number of ways to express your appreciation, as a company and personally, and they cost nothing more than your time. These numbers are but a sample of the men and women currently serving our country, and don’t factor in the Reserves from these branches or currently living Veterans (20+ million). In brief, nearly 8 percent of the US population are active Military personnel and Veterans. NMAM is our chance to take a moment and give thanks for the impact they’ve had and are having on the lives of those we hold dear. “From day one I felt very welcomed and part of the WilsonHCG family and DNA. I'm proud that time is set aside to reflect on those who have chosen to join our Military, be it a service member or their family members. As you personally or as a leader within your organization consider ways to show appreciation, one example to consider is welcoming home Veterans at your local airport. In the Tampa area, where I am located, the next ceremony is set to be held June 4 at St. Petersburg Clearwater Airport. A simple internet search should return where/when you can get involved! Something as simple as showing up to say "thank you" and "welcome home" can go a long way in the hearts of active duty personnel, Veterans and members of Military families. 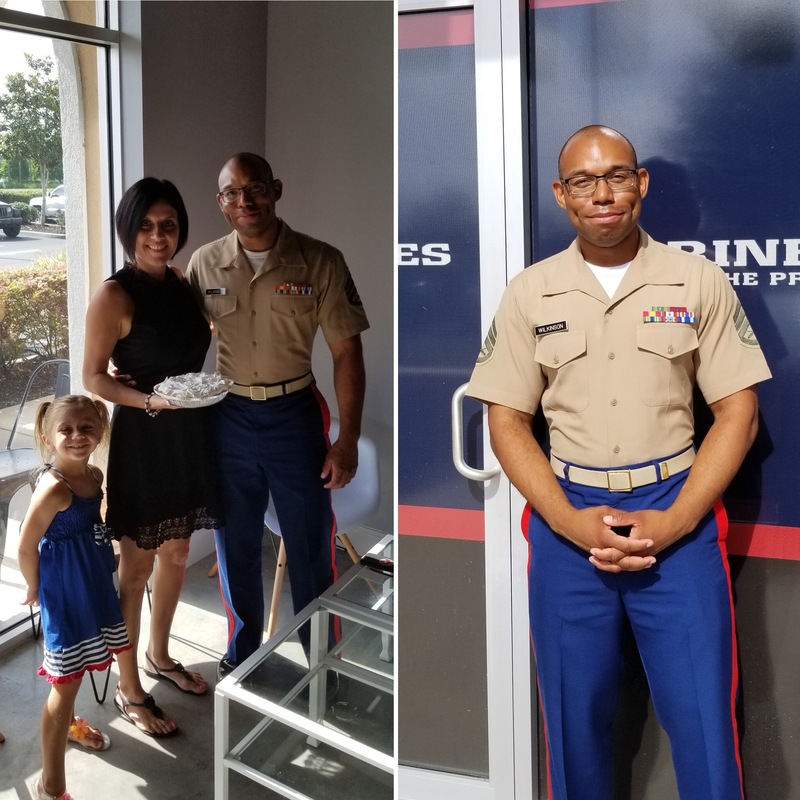 To honor NMAM in one small way, my daughter Mackenzie and I recently visited a local Marine Corps office to deliver baked goods to Sergeant Vivian E. Wilkinson and his team. I ended up growing a newfound understanding of just how blessed and fortunate my family and I truly are. These men and women give up far more than I could ever imagine; they put everyone before their own lives. And so I encourage you, though NMAM is nearly over – it’s not too late! Whether working on initiatives to improve and empower the recruitment of diverse populations such as Military personnel (contact WilsonHCG if you're in need of strategic support here! ), or personally seeking to express gratitude, please consider taking action today. On behalf of WilsonHCG, thank you to ALL service members – Active, Veterans, Reserves and Fallen. We hope you feel valued and appreciated not only during NMAM but year-round. Anna Hutchinson is a WilsonHCG Recruitment Consultant, operating out of the company’s corporate headquarters in Tampa, Florida. Anna brings nearly 20 years of senior recruitment experience, with specialties in sales and finance recruitment, social networking, and building business relationships. In addition to her professional role, Anna regularly volunteers at Florida Wesley Chapel Hospital.